← Come One, Come All… to the Ghostship Ball! Suddenly Johna had a flash. “I bet it’s wheels. The eggs go on little wheels to be transported for processing, and they probably lubricate the wheels with something!” (Can you guess which one of us is the scientist and which the engineer?) We were envisioning something like this or this. The thought was the deed. And fortunately, we had a handy household chemical that should do the trick: Acetone, otherwise known as nail polish remover. So we launched an experiment. And in the course of doing so, as Vlad pointed out, we encountered many of the common pitfalls of “real” science: ad hoc experimental design, materials limitations, inadequate sample size, data completeness issues, experimenter bias, exaggeration of the scope of the conclusions… Indeed, the very goal of “validating”—instead of neutrally testing—our hypothesis was setting us up for confirmation bias: we wanted the hypothesis to be true. We cleaned roughly half, six out of the fourteen, of the eggs with acetone, leaving the other eight untouched. Why not seven—exactly half? This happened because we were still adjusting the experimental design as we went along—a big no-no. Of course, since we didn’t know what the waxy substance was (if, indeed there was a waxy substance), we had no way of knowing whether acetone would remove it. But we used acetone anyway because (a), it does a pretty good job removing many oily and waxy chemicals, and we’d already determined that whatever it was wasn’t soluble in acid (vinegar) or water; and (b), we, um, had acetone lying around. Which is another common occurrence in science: you use the tools you have, or that you can afford, rather than what might be optimal. Of course, in “real” science you cannot (yet) admit in your published paper that you could not do the experiment right because you didn’t have the money. 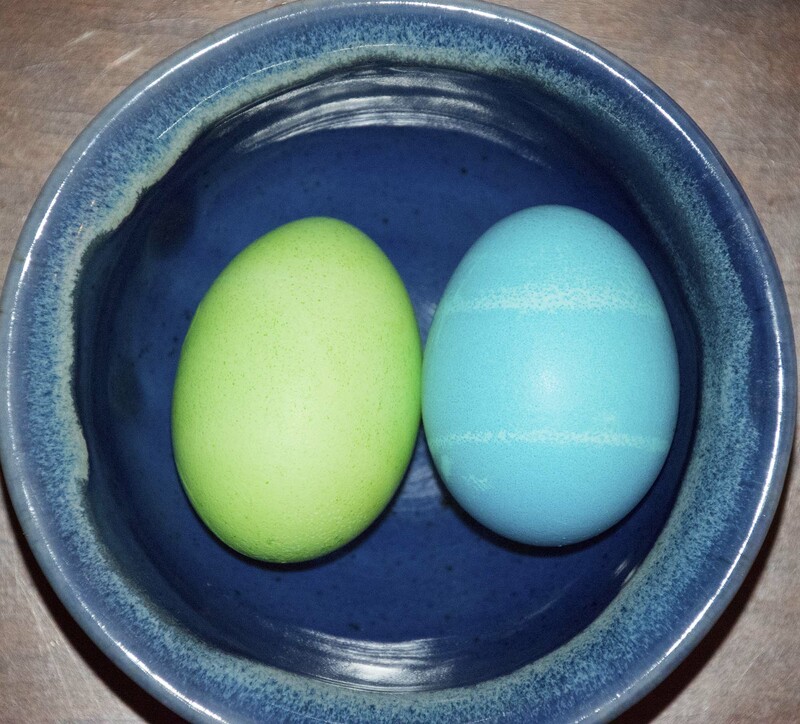 The first batch of acetone-treated eggs went into the dye. We watched closely. Were those lines forming? “No, no, lines go away!” Johna shouted, and aggressively sloshed dye over the treated eggs, trying to get the lines to disappear. Vlad laughed: “See how it works? You want a certain result, so you’re pushing to make it happen.” As indeed Johna was. Properly, the experiment should have been conducted blind: we should have been unaware which eggs were treated and which untreated until the end of the experiment. As the first batch of eggs matured, we realized our testing methodology was too primitive: We were only recording “line” or “no line”. 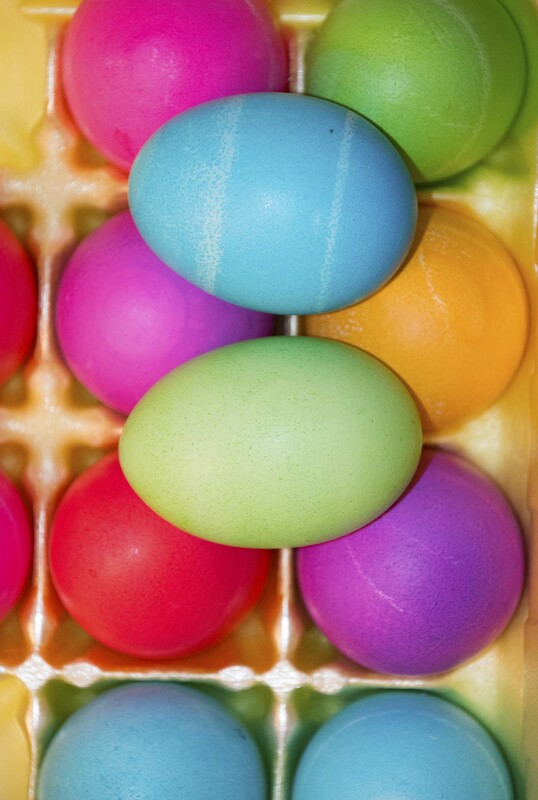 In reality, some eggs had no lines at all, some had very clear lines… and some were in-between. What did we do with the in-between ones? Count them as “line” because we could faintly see lines, or “no line” because the lines were clearly fainter? There was really no good solution to this problem short of going down the rathole of measuring line width, sharpness, etc. So the results we recorded were a simplified, and very ad hoc, representation of the actual situation. With the third and final batch of eggs we encountered yet another issue. Johna was unsatisfied with the out-of-the box “purple” color. To her eye, it was more of a fuchsia. So she wanted to give one of the purple eggs a finishing wash in blue. That egg—an acetone-treated one—had shown some signs of line formation. But by giving it a double dose of dye, Johna was changing the background treatment of that one egg—inconsistent test methodology in action! But hey, we were making Easter eggs! So into the blue dye it went. And for whatever reason, the lines disappeared. (And the egg emerged a lovely shade of true purple). Finally it was time to tally up the results. Of the eight untreated eggs, seven had lines. Of the six treated eggs, three did. So, did we validate the hypothesis? Well, you could say that untreated eggs had an 87.5% chance of having lines while the treated ones had only a 50% chance—a large decrease, a pretty clear indication that our hypothesis was correct. You could say that—but it would be incorrect. 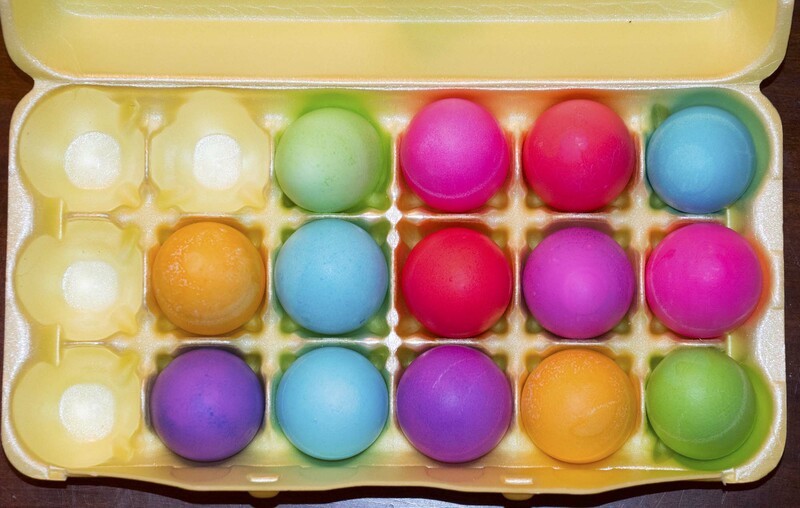 Because we don’t actually know what is “normal” for each group of eggs: maybe the 87.5% result was an extreme outlier for the untreated eggs, and the average would be more in line with those for the treated ones. Or the other way round, of course: the 50% result might have been atypical of the treated eggs. In other words, we don’t know what the error in our measurements was. To estimate the error, we’d have to run several rounds of the experiment, using many more eggs, and obtain a distribution of the results for the untreated and for the treated eggs. Then we could compare the distributions and see if the difference was (statistically and practically) significant. So no, we didn’t validate the hypothesis—although, if this were a “real” science experiment, our results might well have been reported as doing so in the popular press. Furthermore, was the experiment that we did really able to validate the hypothesis in the first place? If the hypothesis was that the lines were the traces of the mechanics of the egg-sorting process, then no. What we did was much more modest: we merely tested the effect of acetone on the lines. The extrapolation to the larger conclusion was not addressed by our results. This is why “real” scientific papers—in contrast to the accompanying press releases—often sound so unsatisfactory. What we have certainly learned, though, is that doing science correctly isn’t child’s play, even when you’re playing with children’s toys. And we did end up with some nicely colored Easter eggs! 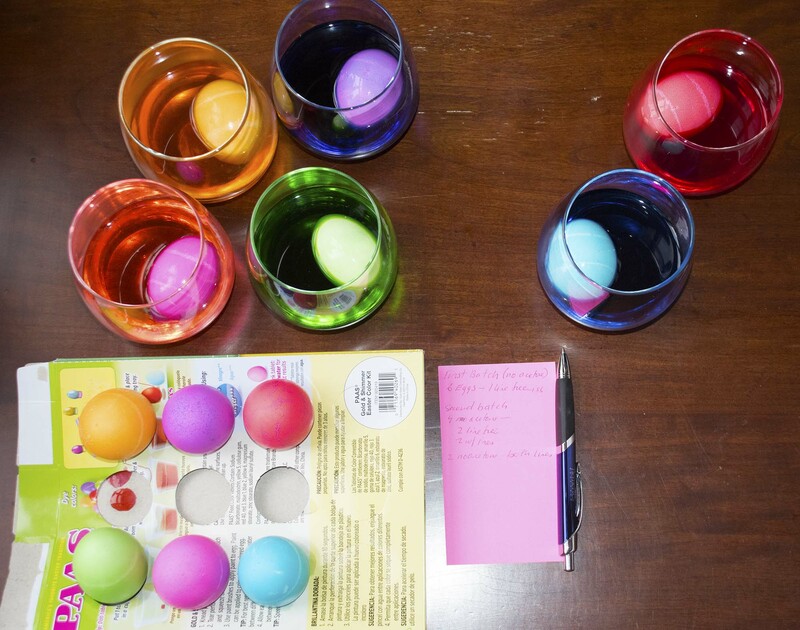 We discovered afterward on the Internet that similar experimentation with Easter egg coloring kits is irresistible for many people, as for example here and here and here… Another lesson: read the literature in the field first! This entry was posted in Life, Science and Technology and tagged Easter, Easter Eggs, Science, Scientific Experiments, Scientific Method. Bookmark the permalink. Love that you both followed your fields of expertise in developing this experiment, and then shared it with us all! Lol … my wife Francis and I howled with laughter as I read to her your story/experiment as we’re enjoying this fine Canadian west coast Easter morning. She used to be a researcher and counselor, now she’s a novelist (and she can make things up)! Your delightful Easteregg story might explains why, …. ancedotal speaking, of course. Thanks for this lovely and pointed story. Thank you! Vlad and I have been known to be entertained by the bathroom sinks in Jacksonville airport…. it truly doesn’t take much. Ha! Vlad ended up painting most of them with impressionistic images… the usual chicks and flowers and bunnies, but also storks, and one building with a chimney..the stripes were all well hidden by the end! I miss doing that! Maybe again one day ! What a great story! That was so fun to read the way you approached the problem and tested. Interesting the point you make about sometimes having to use what you can afford vs what is optimal. Those kinds of barriers are a shame that they get in the way of science. I love the last line about always do a lit review first, haha! It turns out that’s a fairly common issue in science (having to use what you can afford). At one point in his career Vlad was doing scientific research on crabs. Turns out the cheapest way to get them was to head down to Canal St. and pick up a bushel or two… and you could always eat them when you were done! Well the reason I say that is because the past couple years on the Delmarva peninsula there was a shortage and prices went sky high. I did manage to get some last year though. I hope this year is going to be a good one! Roaring laughter! I do love my scientists and engineers…but what I really want to see is the eggs after they were transformed with Vlad’s artwork! Well done! Fascinating! I’m so blond I always thought those lines were caused by the little copper egg dipper that comes in the PAAS dye kit! I too would like to see Vlad’s artwork on the dyed eggs. It couldn’t be the copper egg dipper because we didn’t use it, and anyway there are two lines per egg. Another theory is that the lines are formed as the egg sits in its carton, gripped top and bottom by the cardboard or foam of the carton. But that doesn’t quite fit either. The painted eggs are here. What a great post – the information, explanations, and humor! It would be interesting to try some egg dyeing here in Mexico where the processing of eggs is different, at least in some ways that I have read about. Eggs are not kept refrigerated and are often not as spanky clean as in the US. (I guess this is true in many countries) so I looked up why it’s OK, and learned some interesting things. Since Easter eggs, the Easter bunny, and chocolate rabbits are not part of the culture here, when I return next October I will bring some kool-aid and try that method. No PAAS kits at that time of year! Super post and you guys had lots of fun with your experiments! Eggs actually keep surprisingly well without refrigeration. I’ve taken them on some quite long kayak trips. Presumably, although they will eventually decay, they will not rot quickly in the usual way because they are sterile inside. LOL I wonder what effect the acetone has on whether or not you can eat them. Vinegar and a little dye is okay in our house, but acetone? I’d have to go with no. Therein lies another science lesson: keep track of everything about the experiment, since you never know what information will be needed when you write the final report… In this case, we didn’t keep a permanent record of which eggs were acetone-treated and which weren’t. So now, a few days later, after the eggs have been further painted and moved from container to container, we no longer know. Some things are SACRED! Although it’s extremely weird that the price is still exactly the same (I think) as when I was a kid… $1.99 doesn’t quite seem enough for all the joy packed in that light, flat little cardboard box. But I’m not complaining!